What a great match the 2013 RiverFest final turned out to be. We are already making plans for next year! What a match, what a match, what a match that was ! Dave Harrell was not just the brains behind this years’ successful RiverFest competition, he was also one of the key organisers. Dave loves fishing rivers and was sick and tired of a match scene that had largely gravitated to over stocked stew ponds fishing for semi tame carp. Instead of just bemoaning the glory days of river matchfishing he set himself the task of doing something about it. When we came up with the idea of inviting a cross section of well known names in our sport to become ambassadors for the Angling Trust we were careful not to ask too much of already busy people. But I have to say that Dave has been outstanding. He has spoken at conferences, provided great support for our Action on Cormorants campaign, is always ready with a helpful quote or a bit of wise advice and now, more than we could have ever hoped for, he has rolled up his sleeves and worked tirelessly with Ben and Sandra in our competitions team to make RiverFest one the finest new events in the UK matchfishing calendar. The Angling Trust secured some great additional sponsorship from Thames Water and Severn Trent for the grand final with an additional place added to the list of prizes with 6th place winning £700 and the ten section winners each day seeing their pay out increase to £175. There was also some generous sponsorship from both Daiwa and Bait-Tec. Such a healthy prize pool was one in the eye for those sniping keyboard warriors on some of internet forums who were implying that there was something dodgy going on with Angling Trust competition accounts or that the event was bound to be poorly run. Dave Harrell has been absolutely steadfast in his support throughout and told us to ignore the doubters and let the success of RiverFest speak for itself. 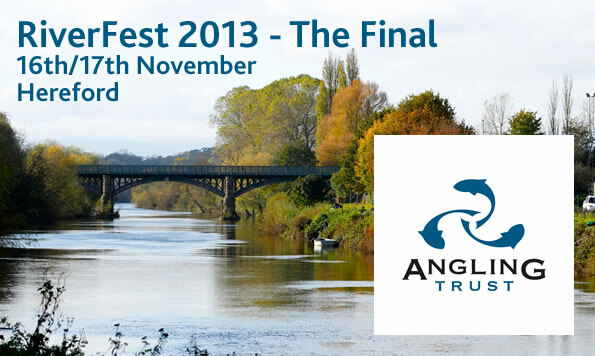 At the Angling Trust we are already working with Dave on seeking a major sponsor for 2014 and have absolutely no doubt that next year’s RiverFest will be a complete sell out. Saturday’s match was an absolute cracker with Paul Bick putting together a wonderful 32lb bag of roach and dace from opposite the rowing club. There were 36 weights over 10lb and 11 over 20lb Proper fishing to be sure! With only a few pounds separating the top six and river likely to fish harder on the second day those in the know reckoned a combined winning weight of 40 to 45lbs was on the cards. This meant everything was in play with those in the frame on Day One needing a reasonable catch to stay in contention but with plenty of scope for anglers further down the table to come back strongly and make it into the prizes. Obviously the draw was crucial. I’ll let Dave Harrell take up the story..
“Yesterday’s winner Paul Bick has drawn peg 11 at the top end and needs barbel. Spud Murphy who had 26lb has drawn peg 93, yesterday’s winning peg. Steve Hemingway had 24lb yesterday has drawn peg 38 and like Paul, will also need barbel to stand a chance of winning. I’ve got a feeling Scott Geens could come good today on peg 96. It’s a potential big weight peg and with the level and pace down on yesterday he could be a big danger if he can get the chub feeding on a waggler approach. All to play for! “Today has been an incredible match of twists and turns and a fitting end to the two day RiverFest 2013 final. Match winner on the day was Scott Geens at peg 96 with 30.10.0 of mainly roach on a bolo and maggot approach. 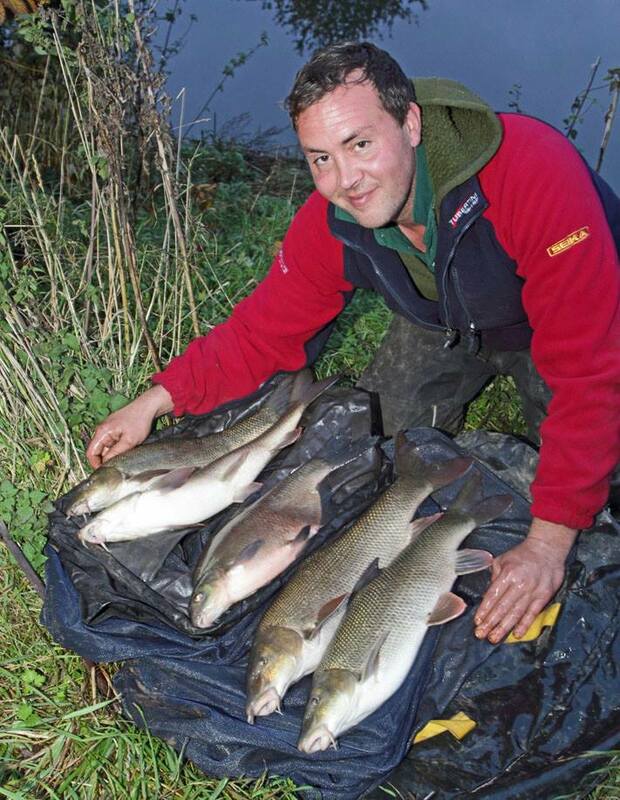 Second was Simon Deakin with 27.10.0 of barbel from peg 41. 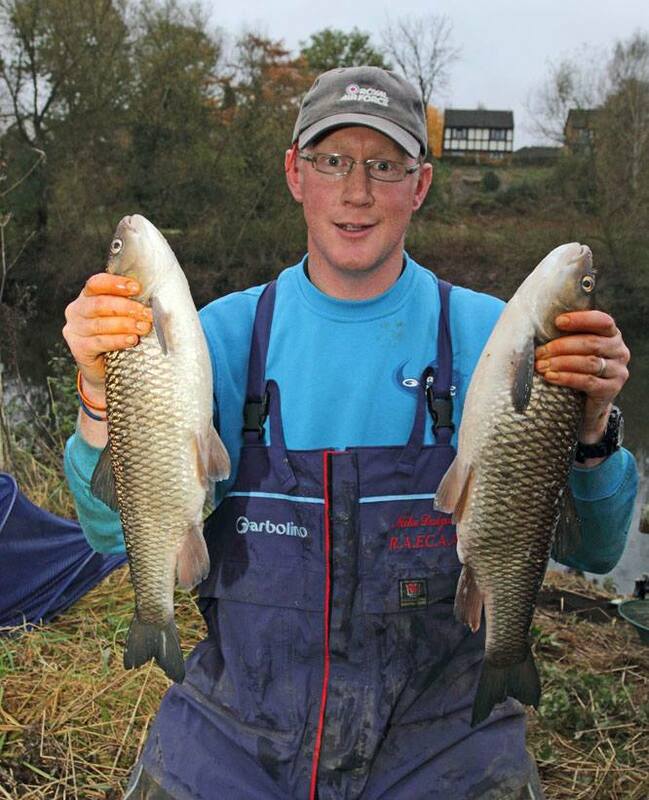 Third was John Urruty with 26.8.0 of barbel from peg 39 and fourth was Chris Parr with 22.9.0. Best fish prize went to John Urruty with a 7-9-0 barbel. In the overall stakes, pre competition favourite Andrew ‘Spud’ Murphy came out on top with 44.9.0 but it wasn’t all plain sailing as he had to draw upon every last bit of his river knowledge to keep fish feeding at peg 93. The victory won him the £10,000 top prize and a superb Angling Trust trophy. 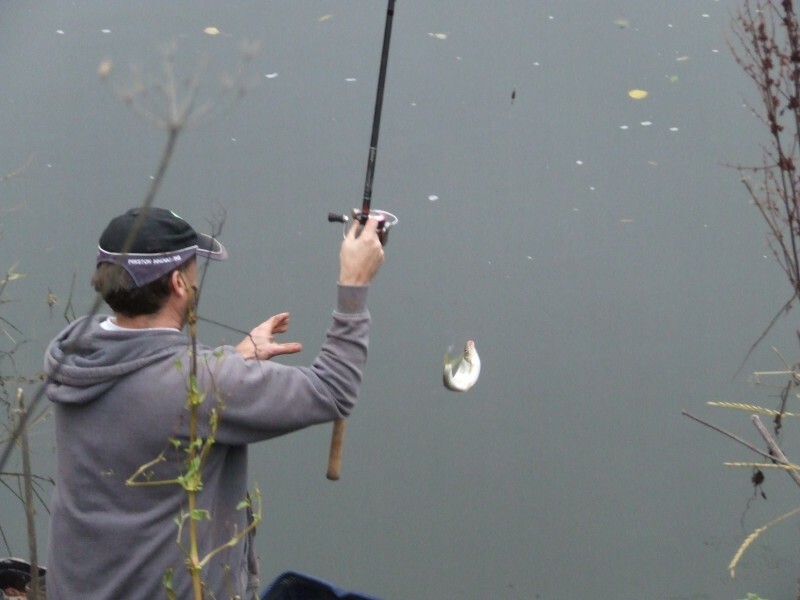 It was a deserved victory by a class angler who proved his pedigree on both days. Incredibly, there was a tie between three people for second place -Paul Bick, Michael Dalziel and Chris Parr all with 41-1-0. All three picked up £3,333.33! John Urruty came in fifth and took the £1,000 prize with 40-14-0 and sixth place (£700) was claimed by Scott Geens with a two day total of 39-6-0. After the draw Dave Harrell, who despite not qualifying himself knows the venue inside out, decided to have a bet on Scott Geens on peg 96. This turned out to be another great decision by Mr Harrrell as Scott won the match on the day…and our RiverFest founder went home £780 to the good! Dave Harrell, Martin Salter and Mark Lloyd present the cheques and trophy to ‘Spud Murphy and the other winners. The presentation back at the Rowing Club was a delight with a sea of happy faces and a great atmosphere. 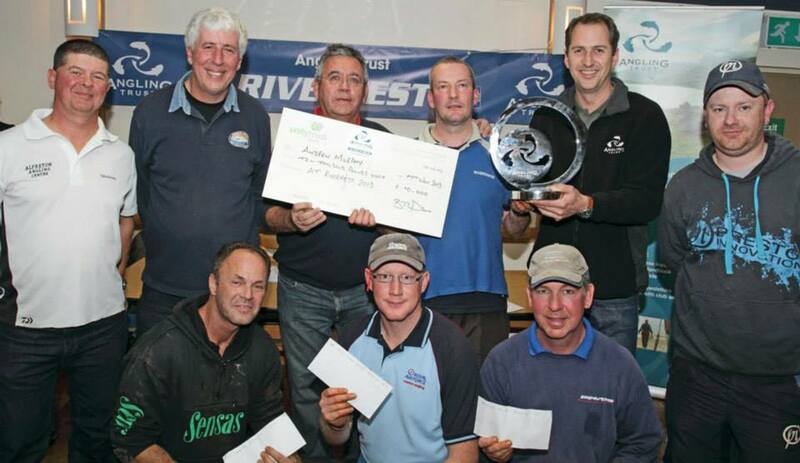 Angling Trust boss Mark Lloyd handed over the impressive trophy to ‘Spud’Murphy and healthy cheques to winners. Both Angling Times and the Mail were there along with Andy Ford from Sky TV to record the occasion. I had bumped into several old friends on the bank, including Fishing Magic’s Geoff Maynard, who had come along to watch the action and the room was packed as Dave read out the results, thanked all the organisers and our hosts at Hereford & District AA and invited me to say a few words. 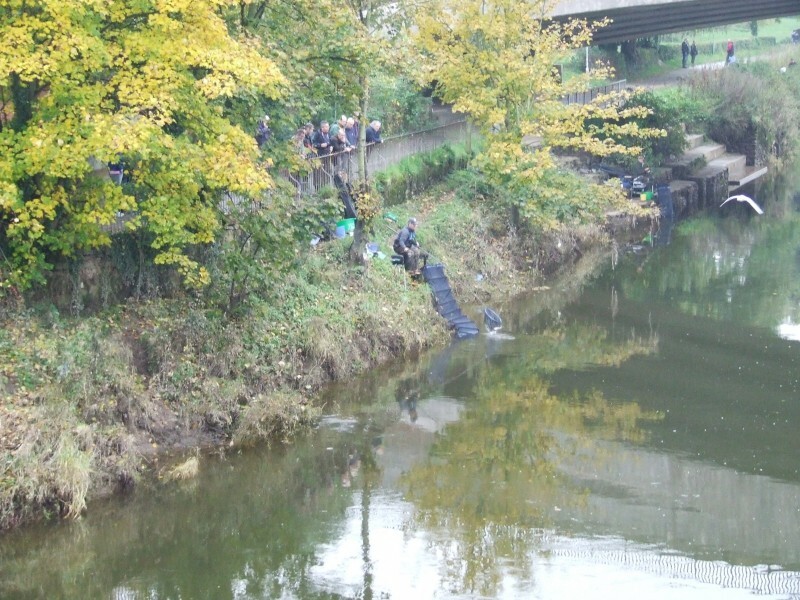 I made it clear that for us at the Angling Trust the health of our rivers was a huge priority and that it was it would be a sad day for our sport if anglers walked away from natural venues and wild fish. The success of RiverFest, made possible by the vision of Dave Harrell with solid support from the matchfishing community, showed how anglers in this country are not ready to give up on Britain’s rivers. “I’ve received a huge amount of accolades about RiverFest 2013 from many anglers over the past couple of days and I’ve been overwhelmed with the amount of positive messages and calls I’ve received since the weekend so thanks to everyone who has been in touch. It means a lot. On behalf of all the anglers who took part, I’d just like to take this opportunity to thank two other people who deserve a huge amount of credit for making the competition happen. I had several meetings with Ben Thompson and Sandra Drew at the Angling Trust offices to get everything in place and they went out of their way to make sure the administration ran smoothly. Without their involvement RiverFest 2013 wouldn’t have happened. They’re now 100% committed to making RiverFest 2014 even better. RiverFest 2014 is open to any member of the Angling Trust so why not join today and play your part in standing up for our rivers? Great write up from a top bloke, thanks Martin.